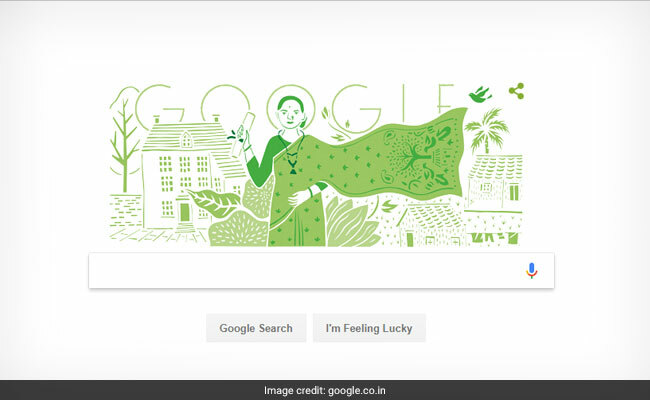 Google Doodle today celebrates the 153rd birthday of Anandi Gopal Joshi. Anandi Gopal Joshi was one of the earliest female physicians in India. New Delhi: Google Doodle today celebrates the 153rd birthday of Anandi Gopal Joshi. Anandi Gopal Joshi was one of the earliest female physicians in India. She was one of the first woman of Indian origin who went on to study medicine in United States. It is also believed that she was one of the first Indian women who set foot on American soil. She was born at a time when getting an education was not a regular occurrence for women. However, Anandibai's husband, a widower and almost 20 years senior in age, was a reformist and supported education for women. He encouraged Anandi to pursue medical education and even wrote to Royal Wilder, a missionary, about Anandi's desire to study medicine. Wilder published Gopalrao Joshi's letter in a local paper which attracted the notice of Theodicia Carpenter who agreed to help the couple. Before she could begin her journey to America her health began to decline. She showed early signs of tuberculosis. Although she was not in good health, her husband encouraged her to take the trip to America and complete her education in medicine. Her health deteriorated further in America because of the extreme cold and dietary restrictions. She, despite all odds, enrolled at the Women's Medical College of Pennsylvania and completed her education. She graduated with an MD on March 11, 1886. Anandibai did not live longer to see how she impacted lives of women in India. She died of tuberculosis in February 1887. Anandibai Joshi took up medicine after she lost her 10 day baby when she was herself only 14 years old because of the unavailability of medical care. She realized that even the basic medical facilities were not available to high caste women like her resulting in tragedies like her own. Anandibai Joshi opened a path for women which a decade before her success would have been unimaginable for Indian society. In her letter to application to the Women's Medical College of Pennsylvania, she wrote, "The determination which has brought me to your country against the combined opposition of my friends and caste ought to go a long way towards helping me to carry out the purpose for which I came, i.e. is to render to my poor suffering country women the true medical aid they so sadly stand in need of and which they would rather die than accept at the hands of a male physician. The voice of humanity is with me and I must not fail. My soul is moved to help the many who cannot help themselves." Anandibai Joshi is remembered not just in India but all over the world for being a beacon for women in medical profession. In 1888, American Feminist writer Caroline Wells Healey Dall wrote a biography on Anandibai Joshi. Shrikrishna Janardan Joshi wrote a fictionalized account of Anandibai Joshi's life in his Marathi novel 'Anandi Gopal'. The novel was then also adapted in a play by Ram G. Joglekar. Tributes to her life does not end at just literary works but also extend to a crater on Venus named after her. The 34.3 km-diameter crater on Venus which is named 'Joshee' lies at latitude 5.5° N and longitude 288.8° E.